冀拯宇, 周吉祥, 郭康莉, 刘晓, 朱兴娟, 姜慧敏, 杨俊诚, 李桂花, 张建峰. 连续施用无害化污泥堆肥对沙质潮土肥力的影响[J]. 植物营养与肥料学报, 2018, 24(5): 1276-1284. JI Zheng-yu, ZHOU Ji-xiang, GUO Kang-li, LIU Xiao, ZHU Xing-juan, JIANG Hui-min, YANG Jun-cheng, LI Gui-hua, ZHANG Jian-feng. Effects of continuous application of non-hazardous sewage sludge compost on fertility of sandy fluvo-aquic soil[J]. Journal of Plant Nutrition and Fertilizers, 2018, 24(5): 1276-1284. Abstract: 【Objectives】 In order to provide theoretical basis and technical support for the utilization of harmless sludge, a study was conducted to investigate the effects of non-hazardous sewage sludge compost on soil fertility and environment quality. 【Methods】 Experiments were conducted in wheat-maize rotation system during 2013 to 2015. At the base of applying N 225 kg/hm2, P2O5 86 kg/hm2 and K2O 113 kg/hm2 (CK), sewage sludge compost was applied at rates of 15 t/hm2 (W1), 30 t/hm2 (W2) and 45 t/hm2 (W3) before the sowing of wheat and maize. 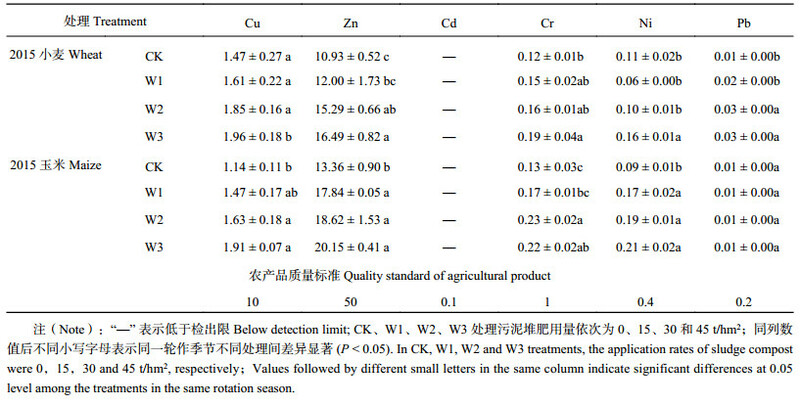 After every harvest, the soil samples of 0–20 cm depth were collected, basic physical and chemical properties, heavy metal contents and soil microbial biomass carbon and nitrogen contents (SMBC and SMBN) were analyzed. The individual soil fertility index of pH, organic matter, total N, available P and available K (IFIi) were calculated, and the soil integrated fertility index (IFI) was obtained using modified Nemero formula to evaluate the soil fertility quality. 【Results】 1) IFI in sludge-treated soils increased with the experimental years. Compared with CK, IFI of W1, W2 and W3 treatments were significantly (P < 0.05) increased by 57.3%, 95.2% and 127.5% in 2015 maize season, respectively, indicating that applying sewage sludge compost effectively improved the soil fertility. 2) SMBC and SMBN contents were increased with the experimental years as well. The SMBC and SMBN contents of the same treatment in the same harvest season were significantly improved from 2013 to 2015. In 2015, the highest SMBC content was in wheat season, which were significantly increased by 109.9%, 176.2% and 216.8% in W1, W2 and W3, compared with the CK; the highest SMBN content was in maize season, which were significantly raised by 55.6%, 100.5% and 162.3% in W1, W2 and W3 treatments, compared with the CK ( P < 0.05). 3) The heavy metal contents in both sludge-treated soils and plant grains were far below the national environmental quality standards GB15618–1995 and the limits in the " agricultural product quality safety regulations of the state”. Referring to the standard of the Soil Fertility Classification Standard (NY/T 391–2000), soil fertility of W2 and W3 treatments met the first grade after three year’s continuous application. 【Conclusions】 Applying high rate of non-hazardous sewage sludge compost is proved effective in improvement of soil fertility and soil microbial properties in a sandy fluvo-aquic soil. Under the experimental condition, applying 45 t/hm2 of sewage sludge compost for three years is the most prominent treatment which increases fluvo-aquic soil fertility to grade I, without leading to obvious heavy metal accumulation in soils and grains. Long term monitoring is still needed for the food and ecosystem safety in the future. 注（Note）：CK、W1、W2、W3 处理污泥堆肥用量依次为 0、15、30 和 45 t/hm2. 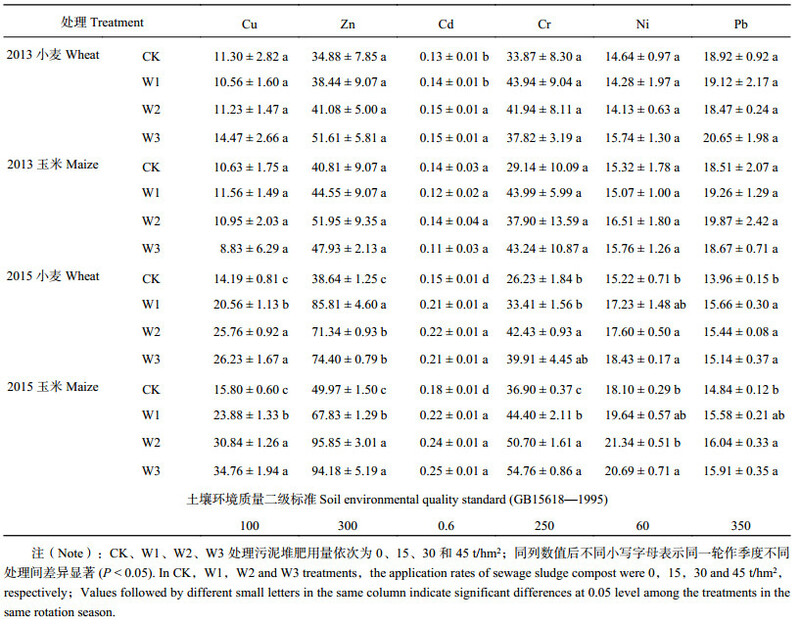 In CK，W1，W2 and W3 treatments，the application rates of sewage sludge compost were 0，15，30 and 45 t/hm2, respectively；同列数值后不同小写字母表示不同处理间差异显著 (P < 0.05) Values followed by different small letters in the same column indicate significant differences among the treatments at 0.05 level. 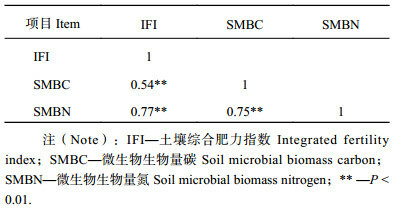 注（Note）：IFI—土壤综合肥力指数 Integrated fertility index；SMBC—微生物生物量碳 Soil microbial biomass carbon；SMBN—微生物生物量氮 Soil microbial biomass nitrogen；** —P < 0.01. 注（Note）：CK、W1、W2、W3 处理污泥堆肥用量依次为 0、15、30 和 45 t/hm2；同列数值后不同小写字母表示同一轮作季度不同处理间差异显著 (P < 0.05). In CK，W1，W2 and W3 treatments，the application rates of sewage sludge compost were 0，15，30 and 45 t/hm 2，respectively；Values followed by different small letters in the same column indicate significant differences at 0.05 level among the treatments in the same rotation season. 注（Note）：“—” 表示低于检出限 Below detection limit; CK、W1、W2、W3 处理污泥堆肥用量依次为 0、15、30 和 45 t/hm2；同列数值后不同小写字母表示同一轮作季节不同处理间差异显著 (P < 0.05). In CK, W1, W2 and W3 treatments, the application rates of sludge compost were 0，15，30 and 45 t/hm 2, respectively；Values followed by different small letters in the same column indicate significant differences at 0.05 level among the treatments in the same rotation season. 李琼, 华珞, 徐兴华, 等. 城市污泥农用的环境效应及控制标准的发展现状[J]. 中国生态农业学报, 2011, 19(2): 468–476. Li Q, Hua L, Xu X H, et al. A review on environmental effects and control criteria of biosolid agricultural application[J]. Chinese Journal of Eco-Agriculture, 2011, 19(2): 468–476. 丘锦荣, 刘雯, 郭晓方, 等. 植物处理后的城市污泥农用对玉米生长的影响[J]. 农业环境科学学报, 2010, 29(5): 990–994. Qiu J R, Liu W, Guo X F, et al. Effect of agricultural application of phyto-treated municipal sewage sludge on maize growth[J]. Journal of Agro-Environment Science, 2010, 29(5): 990–994. 傅华, 王玉梅, 周志宇, 等. 施用污泥对黑麦草草坪绿地土壤理化性质和重金属元素含量的影响[J]. 草业学报, 2003, 12(2): 82–86. 李霞, 李法云, 荣湘民, 等. 城市污泥改良沙地土壤过程中氮磷的淋溶特征与风险分析[J]. 水土保持学报, 2013, 27(4): 93–97. Li X, Li F Y, Rong X M, et al. Risk and leaching characteristics of nitrogen and phosphorus in sandy soil amended with sewage sludge[J]. Journal of Soil and Water Conservation, 2013, 27(4): 93–97. 赵华, 马玲, 龚萍, 等. 施用污泥堆肥对凤仙花生长和土壤的影响[J]. 湖北农业科学, 2010, 49(6): 1317–1319. Liu X, Liu W, Wang Q, et al. Soil properties and microbial ecology of a paddy field after repeated applications of domestic and industrial sewage sludges[J]. Environmental Science & Pollution Research, 2017, 24(9): 8619–8628. 张鑫, 党岩, 冯丽娟, 等. 施用城市污泥堆肥对土壤微生物群落结构变化的影响[J]. 环境工程学报, 2014, 8(2): 716–722. Zhang X, Dang Y, Feng L J, et al. Microbial community dynamics in soil amended with sewage sludge compost[J]. Chinese Journal of Environmental Engineering, 2014, 8(2): 716–722. 许田芬, 谢方文, 丘锦荣, 等. 污泥植物处理后对玉米生长及土壤重金属含量的影响[J]. 中国环境科学, 2012, 32(9): 1640–1646. 刘向华. 可持续发展战略下河南粮食生产能力提高的低碳路径探析[J]. 生态经济, 2015, 31(9): 114–117. 唐卫平. 河南省沙化土地现状与治理对策[J]. 林业调查规划, 2006, 31(6): 109–113. 杨建波, 王莉, 张萍丽, 樊鹏. 河南省粮食主产区中低产田分区综合整治研究[J]. 中国农业资源与区划, 2015, 36(1): 79–85. Yang J B, Wang L, Zhang L P, Fan P. Comprehensive improvement on the medium-low yield fields of the major grain production areas in Henan Province[J]. Chinese Journal of Agricultural Resources and Regional Planning, 2015, 36(1): 79–85. Lu R K. Analytical methods for soil and agricultural chemistry[M]. Beijing: China Agricultural Science and Technology Press, 1999. 吴金水. 土壤微生物生物量测定方法及其应用[M]. 北京: 气象出版社, 2006. Wu J S. Soil microbial biomass–Methods and application[M]. Beijing: China Meteorological Press, 2006. 包耀贤, 徐明岗, 吕粉桃, 等. 长期施肥下土壤肥力变化的评价方法[J]. 中国农业科学, 2012, 45(20): 4197–4204. 李萍萍, 薛彬, 孙德智. 施用城市污泥堆肥对土壤理化性质及白三叶生长的影响[J]. 北京林业大学学报, 2013, 35(1): 127–131. Li P P, Xue B, Sun D Z. Effects of applying sewage sludge compost on the physicochemical properties of soil and growth of Trifolium repens [J]. Journal of Beijing Forestry University, 2013, 35(1): 127–131. 李梦红, 黄现民, 诸葛玉平. 污泥农用对土壤理化性质及作物产量的影响[J]. 水土保持通报, 2009, (6): 95–98. Li M H, Huang X M, Zhuge Y P. Effects of agricultural utilization of sewage sludge on soil physical and chemical properties and crop output[J]. Bulletin of Soil and Water Conservation, 2009, (6): 95–98. 辛涛, 白莉萍, 宋金洪, 等. 施用城市污泥对杨树土壤化学特性及金属含量的影响[J]. 生态环境学报, 2010, 19(11): 2722–2727. 周卫军, 曾希柏, 张杨珠, 等. 施肥措施对不同母质发育的稻田生态系统土壤微生物量碳、氮的影响[J]. 应用生态学报, 2007, 18(5): 1043–1048. 刘恋, 张建峰, 姜慧敏, 等. 无害化污泥施用对土壤有机质、微生物量碳和氮含量的影响[J]. 农业环境科学学报, 2014, 33(5): 978–984. Liu L, Zhang J F, Jiang H M, et al. Effects of non -hazardous sewage sludge application on soil organic matter and soil microbial biomass carbon and nitrogen[J]. Journal of Agro-Environment Science, 2014, 33(5): 978–984. 朱琳莹, 许修宏, 姜虎, 李洪涛. 污泥堆肥对盐碱土土壤环境和作物生长的影响[J]. 水土保持学报, 2012, 26(6): 135–138. Zhu L Y, Xu X H, Jiang H, Li H T. Effects of sewage sludge compost on soil environment and crop growth of saline-alkali soil[J]. Journal of Soil and Water Conservation, 2012, 26(6): 135–138. 田波, 时连辉, 周波, 等. 不同施用方式下污泥堆肥对土壤性质和草坪生长的影响[J]. 水土保持学报, 2012, 26(2): 116–120. Tian B, Shi L H, Zhou B, et al. Effect of sludge compost on soil quality and turf growth under different applying methods[J]. Journal of Soil and Water Conservation, 2012, 26(2): 116–120. 刘晓, 黄林, 郭康莉, 等. 无害化污泥与钼尾矿配施对沙化潮土土壤质量的影响[J]. 农业环境科学学报, 2016, 35(12): 2385–2396. González-Ubierna S, Carrero-González B, Cruz M T D L, et al. Soil organic matter evolution after the application of high doses of organic amendments in a Mediterranean calcareous soil[J]. Journal of Soils & Sediments, 2012, 12(8): 1257–1268. Carter M R, Rennie D A. Dynamics of soil microbial biomass N under zero and shallow tillage for spring wheat, using 15N urea[J]. Plant & Soil, 1984, 76(1/3): 157–164. 何友军, 王清奎, 汪思龙, 于小军. 杉木人工林土壤微生物生物量碳氮特征及其与土壤养分的关系[J]. 应用生态学报, 2006, 17(12): 2292–2296. 陈安磊, 王凯荣, 谢小立. 施肥制度与养分循环对稻田土壤微生物生物量碳氮磷的影响[J]. 农业环境科学学报, 2005, 24(6): 1094–1099. 赵晓琛, 皇甫超河, 刘红梅, 等. 贝加尔针茅草原土壤酶活性及微生物量碳氮对养分添加的响应[J]. 草地学报, 2016, 24(1): 47–53. Zhao X C, Huangfu C H, Liu H M, et al. Response of soil enzyme activity and microbial biomass carbon and nitrogen to the nutrient addition of Stipa baicalensis steppe in Inner Mongolia [J]. Acta Agrestia Sinica, 2016, 24(1): 47–53. 汪文霞, 周建斌, 严德翼, 马勤安. 黄土区不同类型土壤微生物量碳、氮和可溶性有机碳、氮的含量及其关系[J]. 水土保持学报, 2006, 20(6): 103–106.